Latin America, Middle East And African (Lamea) Insulation Materials Market size is expected to reach $3,030 million by 2023, growing at a CAGR of 6.9%. Insulation materials are used to stop heat, electricity, or sound from penetration into something. Insulation materials market is segmented into three broad categories&dash;thermal insulation, electrical insulation, and heat insulation. The key to an effective insulation system is appropriate installation of high quality insulation materials. The LAMEA insulation materials market is segmented based on type, application, and country. Based on type, it is divided into mineral wool/rock wool/stone wool, polyurethane foam, polyethylene (PE), polyvinyl chloride (PVC), expanded polystyrene (EPS), extruded polystyrene (XPS), and others (carbon glass, fiberglass, aerogel, silicate, perlite, phenolic foam & glass wool). Based on application, it is categorized into residential construction, HVAC & OEM, non- residential, wires & cables, automotive, oil & gas, and others (packaging & consumer goods). 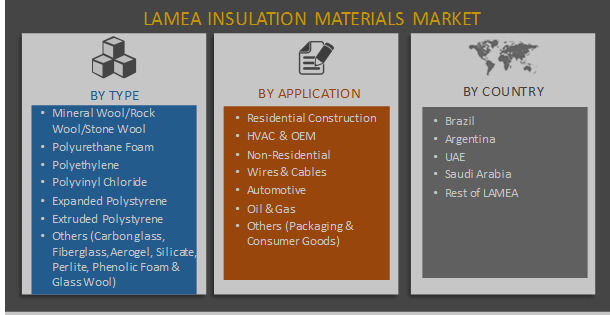 Country-wise LAMEA insulation materials market is bifurcated into Brazil, Argentina, UAE, Saudi Arabia, and Rest of LAMEA. Automotive trade agreements with other Latin American countries and supportive government policies to help innovation in technology and quality improvement are expected to positively affect the market. Efficient management of energy and resources thus, helps to get tax reduction and incentives, which leads to a significant growth in the investment. Heavy oil exports from the Venezuela region in Latin America and Saudi Arabia & UAE are dominant in oil & gas extraction and export for a long time. 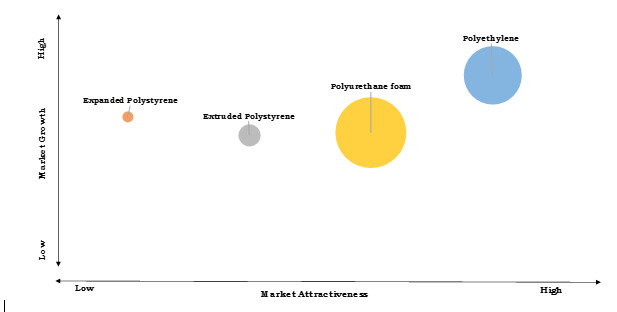 Polyurethane (PU) foam is the significant segment by type in the LAMEA insulation materials market and is expected to be first preference for new entrants as it can withstand in the temperature range from - 200 0C to 200 0C. It enables effective energy savings with minimal occupation of space. PU foam is used for pre-insulating heating pipes. In addition, use of polyurethane foam insulation materials in residential & commercial buildings help to meet advanced energy codes, contributes toward green building certifications, and provide comfort to the building occupants. Residential construction is expected to lead segment during the forecast period, as the Brazil is estimated to construct 11.5 million homes during the forecast period to accommodate the growing population. In addition, government of Brazil has provided federal subsidies and state bank loans to boost the residential construction industry. Insulation in residential construction is an important technology to reduce energy consumption in buildings by preventing heat gain/loss through the building envelope. Polyurethane foam and extruded polystyrene (XPS) are insulation materials in use during residential construction. Significant reduction in energy losses is expected to achieve insulating residential buildings and roofs with the insulation materials. The Brazil is an active market for insulation materials in the LAMEA region. The Rio 2016 Summer Olympics, hosted by the Brazil gave growth to the construction activities thereby, incorporating insulation materials to minimize the energy losses. The market in Latin America is driven by abundance of raw materials, development of ports to ease out transportation, increase in number of educated population, and availability of state-of-the-art production facilities. Key players profiled in the report include, BASF SE, Bayer AG, Bridgestone, Evonik Industries AG, Huntsman International LLC, Kingspan, Rockwool International A/S, and Saint Gobain. Other key players (not profiled in report) in the value chain are Ibiden Co. Ltd., Morgan Thermal Ceramics, Aspen Aerogels, Inc., Knauf Insulation, Asahi Kasei Corporation, and E. I. du Pont de Nemours. This report provides an extensive analysis of the current trends, future estimations, and dynamics from 2015 to 2023 of the LAMEA insulation materials market, which assist to identify the prevailing opportunities. Extensive market analysis predicts the applications that are currently in use and the variants, which are expected to gain prominence in the future. Detailed analysis is conducted by following, key product positioning and monitoring the top competitors within the market framework. Key players are profiled and their strategies are analyzed thoroughly, which portrays the competitive market outlook. Insulation materials are used to resist the progression or transmission of heat, electricity, and sound. This excessive generation or transmission damage the components that leads to its failure. The usage of insulation materials saves 10% to 50% of energy, which is consumed in either heating or cooling the structure. Utilization of insulation materials for residential construction purpose has witnessed highest growth rate in the LAMEA region, owing to the fact that the Brazil is expected to construct 1.4 million homes per year, to accommodate the population increase and better investment and flourishing industries. Polyurethane generated highest revenue in 2016, due to the need for microporous insulation materials from oil & gas sector for pipeline insulation & pipeline support materials, which is increasing on-shore and growth in construction & automotive industries drives the market for polyurethane foam. Venezuela being a top exporter of oil needs protection of the components from the excessive heat-generating operations, which drives the market for insulation materials. Country-wise, Brazil is the most active member of LAMEA in terms of both revenue & volume considering various construction activities undertaken during the summer Rio Olympics in the year 2016. "Latin America, Middle East and African(LAMEA) Insulation Materials Market"